Royden Thornberg was born October 6, 1891, in San Francisco, California, and worked as a telegrapher, radio operator and inventor, as well as proprietor of the Thornberg Electrical Works on Natoma Street in San Francisco. Thornberg inherited the electrical business from his father, A. F. Thornberg. Much of their work between 1907 through 1915 involved installation and maintenance of marine wireless equipment. As part of this marine work, Thornberg himself tested the equipment on board the ships until new operators could be “broken in.” This led to jobs as an operator with many wireless telegraph companies between 1908 and 1924, including Marconi Wireless Telegraph Company of America, Massie, De Forest Wireless Telegraph and Telephone Company, and Federal Telegraph Company using the Poulsen Arc system. Thornberg earned his Commercial Radio License, Second Class, in March 1915, and the service record on his license documents his time on the U.S.S. Arizona between March and December 1915 under Lt. Commander H. R. Patterson. Thornberg was also an inventor; his “Electrical Disinfector and Deodorizer” was patented in the U.S. on 19 June 1917, and he developed several other devices including chemically-treated fuel to repel insects. During World War II, Thornberg and his colleague, John Jardine, built motor generators for power supplies to U.S. Navy radar equipment. The shop also handled maintenance of relief sumps and automatic pumping plants in San Francisco buildings. 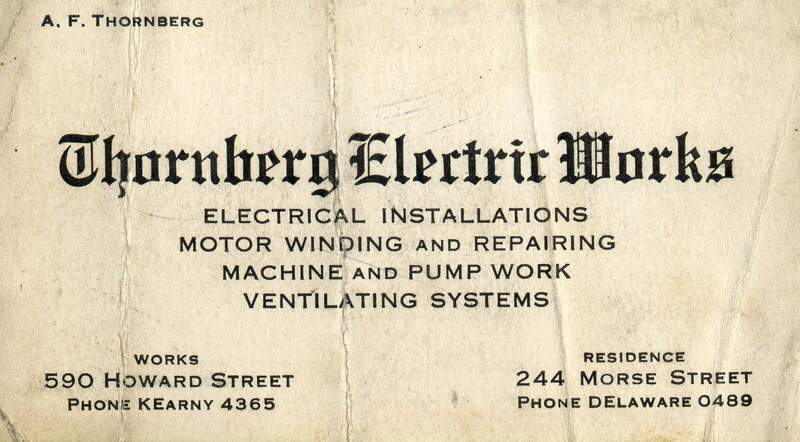 Thornberg Electrical Works closed its doors between 1953 and 1956 after Jardine and Thornberg’s wife passed away in succession, and Thornberg became too ill to maintain his business. Thornberg’s papers, donated to the Foothill Electronics Museum in 1970, are now part of the Perham Collection of Early Electronics. 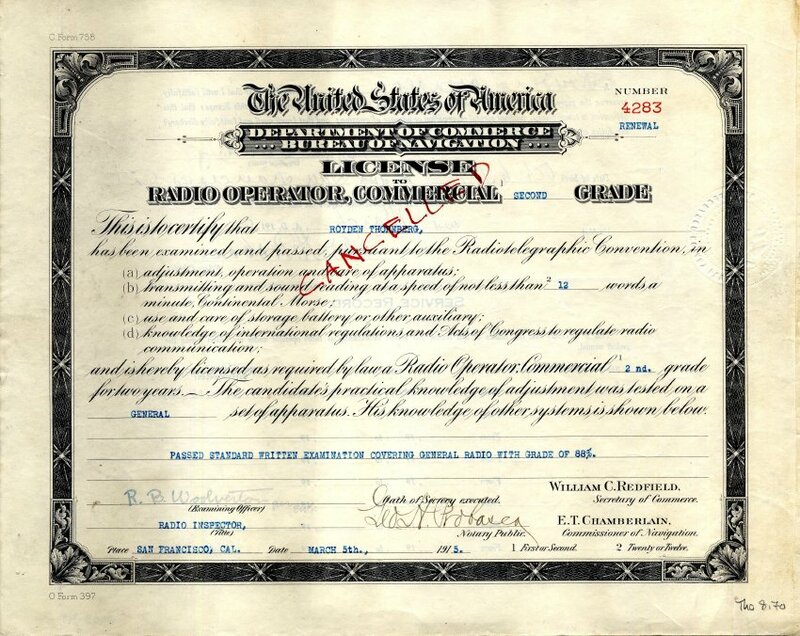 They include Thornberg Electric business records; Thornberg’s radio operator materials, reference notebooks with research on electricity, electrical and mechanical equipment; and electrical and radio equipment brochures. One notebook, dated 1895, is signed “A. F. Thornberg,” and may have belonged to Roy’s father, who is listed as the proprietor of Thornberg Electric Co. circa 1931. Also of interest are Thornberg’s radio operator materials, including his diary from his service on the U.S.S. Arizona, with handwritten reference notes (1915); Thornberg’s original exam for the International Correspondence School’s “Introduction to Radio” course (1930); a typed list of Pacific Coast Radio Stations, “correct for month Nov. 1917;” a brochure for the Pacific Radio School located at 735 Larkin Street, San Francisco; and four badges. Two folders of personal ephemera reflect an interest in spiritualism, philosophy, music, and possible membership in the Scottish Rite of Freemasonry.